BOCAUE--Ginebra scored the first win of the new Philippine Basketball Association season with a 90-79 trumping of TNT at the Philippine Arena on Sunday night. The Barangay pulled away late in the first quarter and finally repulsed the KaTropa, who still provided some scare in the second and the third periods, in the fourth quarter. Japeth Aguilar went 8-for-13 from the field for 21 points with four rebounds, three blocks, and one steal for Ginebra. 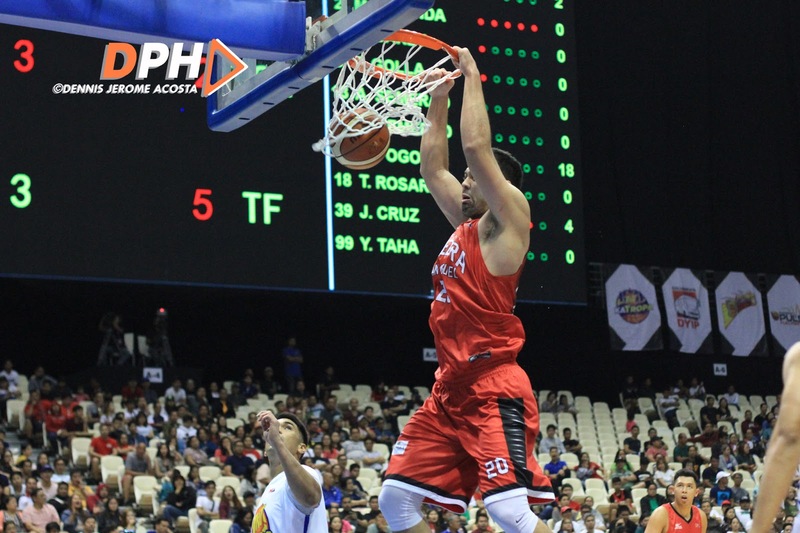 Greg Slaughter added 15 points, seven rebounds, and one assist, while Sol Mercado chipped in 11 points, six rebounds, and four assists. Teytey Teodoro put up four points in his first PBA game for Ginebra. RR Pogoy made 21 markers, 16 boards, one assist, two steals, and one block for TNT. Jayson Castro had his own double-double of 17 points and 10 assists with four rebounds, two steals, and one block. Brian Heruela put up 14 points, two rebounds, two assists, and two steals, while David Semerad and Mike Miranda were scoreless in their respective debuts for the PLDT franchise.